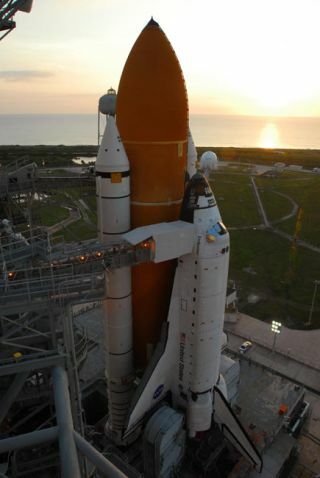 The dawn sky over the Atlantic Ocean reveals Space Shuttle Endeavour sitting on Launch Pad 39A after rollout as it is prepared for a planned August 2007 launch after a major overhaul. Afteralmost five years rooted on Earth, NASA's shuttle Endeavour is again beingprimed for launch after a major overhaul to upgrade and refit the 100-ton spaceplane. The shuttleand its STS-118 astronaut crew are slated to launch Aug. 7 on a construction missionto the International Space Station (ISS). The upcomingspaceflight will mark Endeavour's first flight since late 2002 followingseveral years' worth of maintenance and modifications. "It'slike a new space shuttle," Wayne Hale, NASA's shuttle program manager,said of Endeavour, adding that the orbiter has been inspected from stem tostern. "It's like driving a new car off the showroom floor." During Endeavour'sdown time engineers inspected some 150 miles (241 kilometers) of wiring, enhancedits avionics interface, and added a new power transfer and engine monitoring systemsamong other upgrades. About theonly current hitch with the orbiter is an apparentcabin leak somewhere inside Endeavour's crew module, its attached payloadbay-mounted SPACEHAB cargo module or their connecting tunnels and hatches. Asof Tuesday, engineers were still working to isolate the leak's source. Endeavour,also known as Orbiter Vehicle-105 (OV-105), is NASA's youngest space shuttleand was commissioned in 1987 as a replacement for its sister ship Challenger following the loss ofthat older orbiter, its six-astronaut crew and Teacher in Space ChristaMcAuliffe in January 1986. The shuttle rolled out of its then-Rockwell International(now Boeing) hangar in Palmdale, California in 1991 to join NASA's orbiter fleet. Endeavouris now poised to make its 20th launch into space on NASA's STS-118 missionto deliver cargo, spare parts and a new piece of starboard-side framework tothe ISS. Commanded by veteran astronaut Scott Kelly, the mission also features thefirst flight of teacher-turned-spaceflyerBarbara Morgan, who served as McAuliffe's backup in 1986. Standingout among Endeavour's nearly 200 modifications is a trio of systems makingtheir first operational appearance on a NASA shuttle flight. The shuttleis NASA's first to carry a Station-Shuttle Power Transfer System (SSPTS), whichis designed to allow Endeavour to siphon electrical power from the station's120-volt grid via a docking port connection. The system then converts thatpower to feed the orbiter's 28-volt system. If successful, the new power transfersystem will allow the STS-118 astronauts to conserve Endeavour's own fuel cellsupplies. "[A]ssumingthat it works, we'll be able to fly a 14-day mission so we can add three extradays to our flight," Kelly said in a NASA interview. Endeavour alsosports the first fully activated Advanced Health Management System to watchover the shuttle's three main engines during launch, as well as a three-stringglobal positioning system (GPS) for pinpoint navigation during landings, NASAsaid. The healthmanagement system is designed to monitor vibrations in each of the high-pressurefuel and oxidizer turbopumps - which rotate 34,000 times and 23,000 times perminute, respectively - that feed Endeavour's three main engines with the 526,000gallons (1,991,126 liters) of propellant required for the 8.5-minute launchinto space. If an engine's turbopumps vibrate too much, the new system isdesigned to shut it down. "Anengine would be shut down before it could progress to any catastrophicsituation," Hale said of the monitoring system. The three-stringGPS system, which was tested in part on a shuttle flight last year, replaces Endeavour's1950s-era TACAN system that is gradually being phased out worldwide, he added. "We'vegot a far superior system, far safer, far more accurate to fly our big gliderback home with," Hale said. In additionto testing new shuttle technology, Endeavour now also equipped with hardwarealready installed aboard its sister ships Discovery and Atlantis. Perhaps thebiggest bit of shuttle catch up for Endeavour is the addition of its "glasscockpit," a series of flat screen, full-color multi-functional electronic displaysthat present flight data to the orbiter's astronaut crew. "Endeavourwas the last orbiter to get that modification," Tassos Abadiotakis, NASA'svehicle flow manager for Endeavour, told SPACE.com. Atlantis first flew withthe upgrade during its STS-101 mission in 2000, followed by Discovery in 2005during NASA's STS-114 flight. LikeDiscovery and Atlantis, Endeavour is also now equipped to carry a 50-foot(15-meter) sensor boom, a vital extension of the orbiter's robotic arm thatallows astronauts to scan the orbiter's heat shield in flight to seek out signsof damage, Abadiotakis said. The sensorboom was added as a safety measure following the 2003 loss of seven astronautsaboard Columbia during landing after the orbiter's heat shield had been damagedby fuel tank debris. Theorbiter's wing leading edge sensors, also a post-Columbia safety measuredesigned to record any impacts from debris or micrometeorites, sport a new voltagebooster to extend their in-flight operations, NASA said. A team ofup to 200 shuttle workers helped upgrade Endeavour, as well as perform vitalwiring and structural inspections to once more prepare the spacecraft forflight. "Iwould say that it's better than when it first rolled out of the barn inPalmdale," Abadiotakis said of Endeavour. "We basically reset the vehicle,the clock, back to zero."